The United Kingdom has one of the longest and most involved histories in Antarctica of any country. From the very earliest days of exploration, and onto the commercial activities of the sealing and then whaling days. Britain also provides some of the most compelling stories from the Heroic Age and was a leading light in the International Geophysical Year, IGY leading to the Antarctic Treaty. The UK was the very first signatory nation of the Antarctic Treaty in 1960 and is a consultative party with voting rights able to make decisions about Antarctica. There are a number of modern British scientific bases going back over 70 years which are currently at the forefront of modern research in Antarctica, and many now closed previous bases. Current - British Antarctic Survey BAS - 1961 - present. Arising from the Falkland Islands Dependency Survey on the advent of the Antarctic Treaty in 1961. 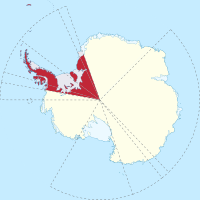 BAS exists to manage the United Kingdoms interest in Antarctica. It currently does this at the research stations detailed in the table above. There are also two dedicated ice strengthened ships, the RSS James Clark Ross and the RRS Ernest Shackleton for station supply, logistics and oceanographic research. Small aircraft, a Dash 7 and Twin Otters are used to supply and support personnel away from bases in the field. BAS headquarters is located in Cambridge, England. In 2011-2012 the budget was �48 million. �13 million was spent directly on the science programme, with the remaining �35 million scientific support including ongoing costs of the ships, aircraft and research stations. The UK is an Original Signatory and a Consultative Party of the Antarctic Treaty in 1960. This means that it is one of the countries that play an active role in Antarctica, it is engaged in substantial scientific research activity - only the consultative parties have voting rights and can make decisions about Antarctica. James Cook reaches 71°10'S on the 31st of January 1774, he is the first to cross the Antarctic Circle and circumnavigates Antarctica, he doesn't sight land though deposits of rock seen in icebergs showed that a southern continent exists. Cook said: "I make bold to declare that the world will derive no benefit from it". Sealers soon made for another of his discoveries, South Georgia where they rapidly depleted the seal population. William Smith a merchant ships captain discovers the South Shetland Islands in 1819 off the Antarctica Peninsula at 67°17'S. His reports of large numbers of seals and whales led to an immediate exploitation with voyages by sealers starting later the same year to take advantage of the resources. In the 1820-1821 season 80,000 seals were taken from the South Shetlands alone. Edward Bransfield and William Smith sight the Antarctic Peninsula January 30th 1820. Royal Naval hydrographer Bransfield and sealing captain Smith circumnavigate and chart the recently discovered South Shetland Islands, then sail further south and see the Antarctic Peninsula. Who first saw the peninsula and so the continent of Antarctica is not agreed, these is one of the strong contenders for the title. First wintering party in Antarctica in 1821. An officer and ten men from the British sealing ship the Lord Melville spent an involuntary winter on King George Island in the South Shetlands. The ship had been driven offshore and did not return to pick them up again. They were rescued the following summer. British whaler James Weddell discovers the sea now named after him in 1823 and then reaches the most southerly point at that time 74° 15' S. No one else manages to penetrate the Weddell sea again for 80 years. James Clark Ross, circumnavigated Antarctica in 1841-1842 reaching a furthest south of 78°11' he named the Ross Sea and Mount Erebus and Terror amongst many other features, the last two after the two ships he sailed in. "Few people of the present day are capable of rightly appreciating this heroic deed, this brilliant proof of human courage and energy. With two ponderous craft - regular "tubs" according to our ideas - these men sailed right into the heart of the pack, which all previous explorers had regarded as certain death ... These men were heroes - heroes in the highest sense of the word." A British expedition though led by a Norwegian and largely Norwegian crewed. 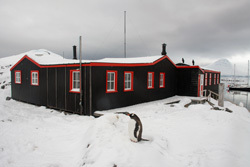 Landed men at Cape Adare in the Ross Sea and built huts. This was the first time that anyone had wintered on the Antarctic landmass. Believed by some historians to be the first confirmed landing on continental Antarctica. Scott's first Antarctic expedition to try to reach the South Pole in the purpose built ship, Discovery. Along with Ernest Shackleton and Edward Wilson, Scott was forced to turn back after a trek of two months having reached 82° south, 480 miles from the Pole, suffering from snow blindness and scurvy. Much exploratory and scientific work was also completed. An almost purely scientific expedition with no grand plans of exploration or reaching new geographical goals. Bruce and his party sailed into the Weddell Sea and became stuck in the ice blissfully unaware of the dangers of the ship being crushed, they were released unscathed. They wintered on Laurie Island in the South Orkneys group. For the second winter three Argentinians were brought in from Buenos Aires being relieved by the Argentinians after the Scotia had sailed for home, the beginning of a continuous Argentinian presence that extends to the present. Ernest Shackleton's second expedition to the Antarctic and the first one as leader. Amongst the scientific and exploratory goals were attempts on the South Pole and the South Magnetic Pole. In attempting to reach the South Pole, a group of four including Shackleton came within 97 miles at 88°23'S when they turned back, had they continued, they would have probably reached the pole, though would have been unlikely to return alive. The Southern Magnetic Pole was reached by Edgeworth David, Mackay and Mawson. Scott's last expedition and the one that cemented the heroic failure of "Scott of the Antarctic" as a historical figure. Scott's fame led to 8,000 volunteers from all over the world wanting to go with him. The expedition had a wide and varied scientific programme and also a goal of reaching the South Pole. Scott thought his attempt on the pole would be the only one when he was planning it, finding out later that the Norwegian Amundsen was planning his own attempt at the same time causing talk of a "race to the pole" that Scott had never intended. Scott and four others reached the pole on the 18th of January 1912 to find they had been beaten a month earlier by Amundsen. The whole party died on the way back to base camp at the end of March 1912, their bodies weren't discovered until November that year. The South Pole having been already reached , Shackleton planned to cross the Antarctic continent from coast to coast via the pole. His was another greatly over-subscribed expedition. 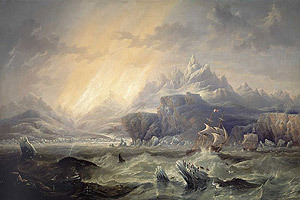 The expedition came no-where near achieving its aims with the ship, the Endurance being sunk before even reaching its first landfall at the edge of the Weddell Sea. The story remains one of the most incredible adventures of all time with all members of the ships crew brought safely home by Shackleton against a whole range of unfavourable odds . Shackleton's last expedition, originally planned to be to the Arctic and changed to the Antarctic due to delays, an ambitious range of activities were planned. Again many thousands of applicants, Shackleton was very famous by now, 8 of the crew were old shipmates from the Endurance. After more delays the expedition arrived at South Georgia where on the 4th of January 1922 Shackleton died of a heart attack at the age of 48. Thus the Heroic Age of Antarctic exploration came to an end. Discovery Investigations 1925 to 1951. A series of oceanographic voyages in the Antarctic Ocean funded by taxes on the whaling industry by the RRS Discovery, the ship built for Scott's 1904-1907 expedition and later, the Discovery II another purpose built ship though this time, steel hulled and stronger. Initially the purpose was to find what was needed to preserve the whaling industry by charting inshore regions and by carrying out ship and land-based investigations into whale biology. In January 1925 Discovery House was established at King Edward Point, South Georgia to accommodate scientists working on the whale carcasses that were being processed in the whaling station of Grytiven that was nearby. The findings over the period were published in an extensive though irregular series of Discovery Reports, the Discovery Investigations became part of the Institute of Oceanography in 1951. British, Australian and New Zealand Antarctic Research Expedition 1929-31. BANZARE - Douglas Mawson. The French had in 1924 laid claim to Terre Adelie or Adelie Land in the sector directly south of Australia. What became popularly known as BANZARE was an attempt by (now Sir) Douglas Mawson and others in Australia to encourage the government to file a similar claim. After a meeting in London, a joint expedition was proposed, partially privately funded, it used the RRS Discovery and had a small floatplane. The expedition didn't overwinter in Antarctica but consisted of two summer cruises in 1929-30 and 1930-31, surveying and mapping by ship and from the air. Land was claimed as British territory. It led to the establishment of the Australian Antarctic Territory. British Graham Land Expedition 1934 - 1937. A small low budget expedition in a 130 ton schooner, the Penola. A very successful expedition that explored Graham Land at the tip of the Antarctic Peninsula using ships, a small aircraft and sled dogs. Mainly famous to my mind though for the invention of the string vest. Operation Tabarin 1943 - 1945. A secret Royal Navy wartime operation intended to stop enemy ships using Antarctic waters. With little else to do while waiting around much biological, geological and meteorological data was gathered. At the end of the war responsibility for Operation Tabarin was transferred from the admiralty to the Colonial Office and became the Falkland Islands Dependency Survey. Falkland Islands Dependency Survey - FIDS 1945 - 1961. An ongoing British expedition to occupy, administer and survey the sector of Antarctica including the peninsula claimed by Britain. A continuation of the wartime Operation Tabarin, bases were given a name and a code letter. Base A was at Port Lockroy on the west side of the Antarctic Peninsula, it was actually the second base to be established, the first was base B at Deception Island in the South Shetlands established on the way to what would be base A (picture left). Norwegian-British-Swedish Antarctic Expedition 1949-1952. Swedish led two year long expedition to Dronning Maud Land, an area that had only previously been photographed from the air and not explored on the ground. An overwintering team of 15 supported by 60 sled dogs and 3 weasels (tracked vehicles for travel over snow) pursued a programme of exploration and surveying along the coast and deep inland. Seismic surveys showed for the first time the complex mountainous terrain that lay beneath the covering of ice. Commonwealth Trans-Antarctic Expedition 1955 - 1958. Funded by the governments of Britain, Australia, New Zealand and South Africa, this was an attempt to do what Shackleton had set out to do in 1914, to cross the Antarctic Continent from sea to sea via the South Pole. Led by the British Vivian Fuchs from the Weddell Sea and New Zealander Edmund Hilary from the Ross Sea. Hilary arrived at the Pole on the 4th of January 1958, Fuchs on the 19th, they both reached the Ross Sea again on the 2nd of March. International Geophysical Year (IGY) 1957 - 1958. Britain was one of the leading nations in this international event that was pivotal in establishing Antarctica as a continent for peace and science leading to the signing of the Antarctic Treaty in 1961. The still fully functional Halley Research Station was established on the Brunt Ice Shelf in 1956 in preparation for the IGY. 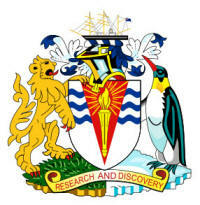 Current - British Antarctic Survey BAS - 1961 - present. See top of page. There is a historical claim by the UK dating back to 1908 of that area of Antarctica between 20°W and 80°W and stretching as far north as 60°S. The UK is one of seven nations that made a claim to land in Antarctica before the Antarctic Treaty of 1961, these being Argentina, Chile, the United Kingdom, France, Australia, New Zealand and Norway. The UK, France, Australia, New Zealand and Norway all recognize each other's claims, these are non-overlapping. The UK claim wholly includes the Argentinian claim and includes about half of the Chilean claim. The Antarctic Treaty, Article IV � 2 states: �No acts or activities taking place while the present Treaty is in force shall constitute a basis for asserting, supporting or denying a claim to territorial sovereignty in Antarctica. No new claim, or enlargement of an existing claim, to territorial sovereignty shall be asserted while the present Treaty is in force�. No activities occurring after 1961 can be the basis of a territorial claim. No new claim can be made. No claim can be enlarged. Practically though territorial claims have been effectively suspended since 1961.